Star Trek teasers ended last Friday after a revealing announcement by WALT DISNEY and LUCASFILM. In epic news J.J. Abrams (Star Trek's movie director) is joining THE FORCE to direct........Star Wars Sequel: Episode VII. Can you believe it? Well its OFFICIAL. Perhaps we should have suspected mutiny, (just kidding) when Bad Robot/Paramount added 'INTO DARKNESS' to STAR TREK's 2013 sequel. In a daring swoop gunning for trek's coolest frontiers, Lucasfilm's chief, Kathleen Kennedy beamed over to Bad Robot headquarters to meet J.J.Abrams in California! George Lucas's Star Wars progeny, the 'chosen one' nabbed Star Trek's brightest star right out from under our geeky noses. Who assimilated who? you decide! Maybe Romulan spies working on the inside of Bad Robot HQ, helped pull this coup off? Isn't it fascinating why Lucasfilm specifically targeted J.J. Abram's Bad Robot company now the hottest movie production company in Hollywood. "If there's something I'm dying to see, it's the brilliance and optimism of (Gene) Roddenberry's world brought back to the big screen," said Abrams. "Alex and Bob wrote an amazing script that embraces and respects Trek canon, but charts its own course. Our goal is to make a picture for everyone — life-long fans and the uninitiated. Needless to say, I am honored and excited to be part of this next chapter of Star Trek." Hollywood Reporter reckons LucasFilm's chief clinched the deal with Kennedy landing Abrams for Disney. Considering Lucasfilm's President visited Bad Robot, theres little doubt Kennedy hyper-spaced were no woman has gone before, swooping a big deal for Disney. She really is a sneaky little denibian slime devil and smart too, LOL. The plan is for Kennedy to work with Director Abrams while Oscar winning screenwriter Michael Arndt has been plugging away since last October. The next Star Wars Sequel is expected to hit the big screen sometime in 2015. "It's very exciting to have JJ aboard leading the charge as we set off to make a new Star Wars movie," said Kathleen Kennedy in reports by Trekmovie and Hollywood Reporter. Kennedy added "J.J. is the perfect director to helm this. Beyond having such great instincts as a filmmaker, he has an intuitive understanding of this franchise. He understands the essence of the Star Wars experience, and will bring that talent to create an unforgettable motion picture." ABRAMS CONFESSION AT SAN DIEGO'S COMIC-CON INTERNATIONAL WITH WRITERS AND PRODUCERS OF STAR TREK ON 26TH JULY 2007. In 2007, a Star Trek COMIC CON yielded J.J. Abrams fessing up about Star Wars. It was like STAR WARS "confession" time where he trekked all to a packed hall of STAR TREK'S FANS! WOW! Blow me down, did Abrams really admit he was a Star Wars fanboy? So heres J.J. Abrams remarks from Comic Con in 2007. What did you make of J.J. Abram's Comic Con? Who are you rooting for Star Trek or Star Wars? You've probably guessed that I love Star Trek aliens in all shapes great and small. So my choice for Geektwin's 'My Favorite Martian' bloghop is Thermian Mathesar! Every Sci Fi fan who's been curious about the merits of Science Fiction will definitely get a good chuckle out of Galaxy Quest. Tim Allen stars as Captain Jason Nesmith, Commander of the starship NSEA Protector when the unthinkable happens. The plug is pulled on Nesmith's "Galaxy Quest" show tossing our 'defenders of the galaxy' out in the cold. Its funny watching Nesmith grabbing all the media attention while his washed up crew do all the legwork attending sci-fi conventions etc where loyal fans still adore them eighteen years later. Surely he reminds you of someone? 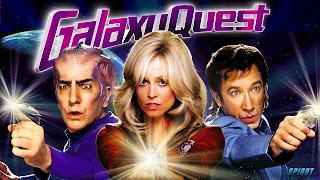 Galaxy Quest is fun to watch and I can think of no better homage to Star Trek's classic series or TNG! The actors fall from stardom have them squabbling over the smallest of stuff and ready to chuck in the towel. The fun starts when Nesmith is approached by a race of aliens proclaiming to be "Thermians" led by their completely clueless chief "Mathesar" which is why hes so totally cool. To cut a long story short these guys have completely confused ideas about Galaxy Quest's TV show." The thing is see Mathesar's race actually believes in the crew of the NSEA Protector and has built them a REAL STARSHIP that can fly in outerspace! He calls Galaxy Quest's adventures: The real world "historical documents" giving Nesmiths crew the chance to redeem themselves in the eyes of gullible fans who've been worshipping them for years. Most fans and geeks would probably flip out at the prospect of being aboard a real spaceship surrounded by aliens but not Tech Sgt. Chen played by Tony Shalhoub. Hi guys. Listen, they're telling me that the generators won't take it, the ship is breaking apart and all that. Just FYI. The viewscreen goes black. The ship ROARS forward. ALEXANDER Yells: We've got to stop! Things only get better when the evil villain SARRIS (whos one mean, ugly, reptile) shows up and to blazes with the rest of the Galaxy. Check out the creepy smiling aliens with those sharp teeth! So who's my favorite martian? Thermian Mathesar! Logic out the airlock, thats my story and I'm sticking to my guns. Does Capt Jason Nesmith remind you of anyone? Never give up, never surrender to the Martians, Trekkers! Who's your favorite alien character? 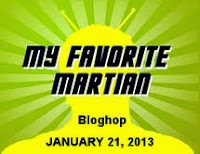 I've signed up for Geektwins'My favorite Martian' bloghop, which is hitting the blogsphere on January 21st this coming Monday. So prepare yourself friends, the word is ALIENS. Over the years I've written over 30 separate blurbs on these critters for you to enjoy. All we have to do is say who our favorite alien critter is! Monday's bloghop is the perfect opportunity to set the blogverse straight once and for all. Which extraterrestrial creature, tribble or little green pal from science fiction means the world to you and why? LOL. Tribble long, Hobbits, Zombies and Martians! J.J. Abrams said recently Star Trek Into Darkness begins with a group of people [USS Enterprise crew] being tested in a way they have never been tested before. Logic and Emotional Control. His cunning ancestors were an extremely violent race of people who waged almost constant warfare against each other. Technological leaps in Vulcanian society pushed the species to near extinction which now ironically, thanks to J.J. Abrams new movie timeline, is now scattered across the galaxy. 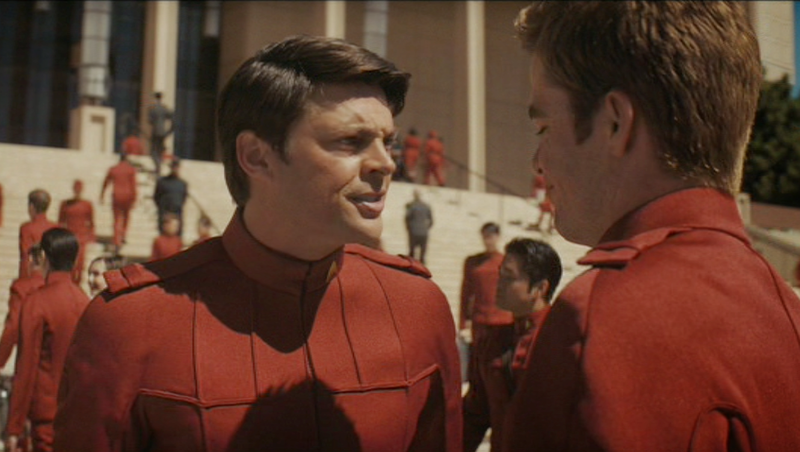 Now, I'm not getting all logical on you but shouldn't Dr McCoy be cutting in, complaining right about now? Star Trek Into Darkness will likely appeal to naughty young minds exploring new frontiers, so its neat Uhura(played by Zoe Saldana) and Spock are all wrapped up in each other. Uhura pecks her vulchie and Spock's all set for his volcano gig. Freeze the volcano and rescue the Nibiru creature inside without being detected or blowing the prime directive. Sounds simple doesn't it? All helmsman Sulu had to do was flick a few switches controlling the shuttlecrafts descent and altitude above the lava flow. Spock's dangling off a cable and then Sulu (played by John Cho) goofs up big style by losing his nerve. Can you believe it? Spock should have fallen to his death, leaving behind a fazed Sulu aboard the shuttle trying to figure out what went wrong. Heck yeah, it had to be the intense heat blitzing the shuttles impulse engines didn't it? We knew that!!! Live Long and Prosper, Trekkers, Niners and Trekkies! Heres a classic Nimoy for you to enjoy. If you love Star Trek then feast your eyes on this epic parody, It made perfect sense as I crawled out of bed today to go to work. I actually found myself smiling and humming the tune, LOL. 'Today, I don't feel like doing anything.' sung by Bruno Mars. Any ideas on how to resist lazy yearnings? or is it better to joint long and prosper?